The Complete History of Guest Stars on "The Fresh Prince of Bel-Air"
The Fresh Prince of Bel-Air premiered 22 years ago today, on September 10, 1990. The show was rapper Will Smith's saving grace. He saw success in the late '80s as part of hip-hop duo DJ Jazzy Jeff & The Fresh Prince, but by the time the decade was over, excessive spending and negligent income taxes put Will in the hole with the IRS, to the tune of $2.8 million. Thankfully, Quincy Jones and NBC approached Will Smith with the idea of a television program centered around him, and the sitcom became a huge hit, lasting six seasons. 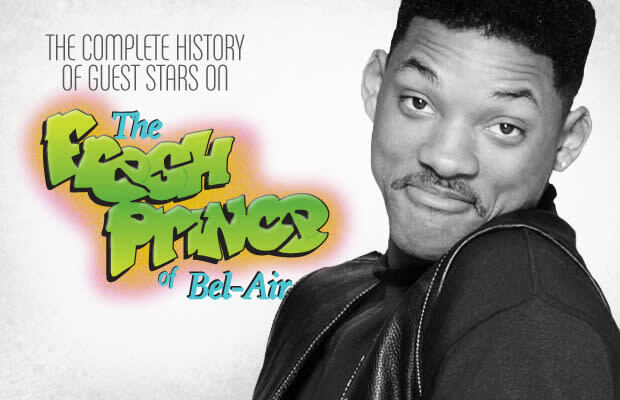 Not only are those 148 episodes are responsible for Will's transition to a career that mostly involves acting, but they also represent the hotbed of cultural activity that was the first half of the '90s. From Heavy D to Boyz II Men, vintage photo site Up North Trips laced us with flicks of every guest star appearance in the show's history. Celebrate its legacy with this quick trip down memory lane.